Perhaps as long as 2,600 years ago, Mesoamerican peoples began using cacao beans to brew up a bitter drink, and for probably as long, molinillos have been used to beat the mixture into a frothy drink. Taking on various forms throughout Latin America, today the molinillo is still very popular all around Colombia, where chocolate is a staple in almost every home. 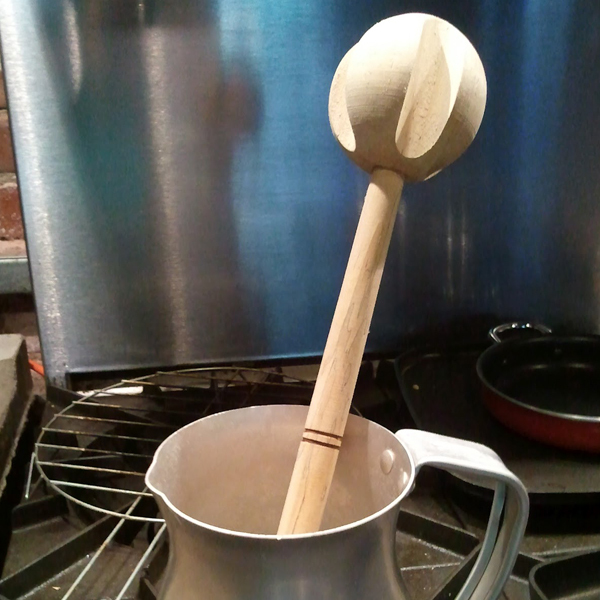 The wooden molinillo is especially good for use with traditional clay chocolate pot as they will not scratch the surface. To use, simply place the round part inside the liquid, hold the molinillo’s handle between the palms of your hand, and rotated the handle by rubbing the palms together. Wooden molinillos need special care in order for them to last. Not taken care of properly and letting them soak in water, such as a dishwasher, can cause them to crack and lose their attractive finish. Always hand wash the molinollo after every use with mild soap and warm water, and dry them thoroughly. Over time, the wood will darken with age and use due to the chocolate, but that will not damage or change its functionality.